Kathleen’s Story: A Personal Story of our Recovery from the effects of Monsanto’s RoundUp and the Scourge of Glyphosate. A Ten Year Journey to Hell and back. Today I’d like to share Kathleen and Roy’s story about how they beat interstitial cystitis. I found this story very moving and inspirational – it shows once again that interstitial cystitis can be overcome. The cause of interstitial cystitis may be different for each of us and the only way to overcome this debilitating condition is to keep searching for that root cause. 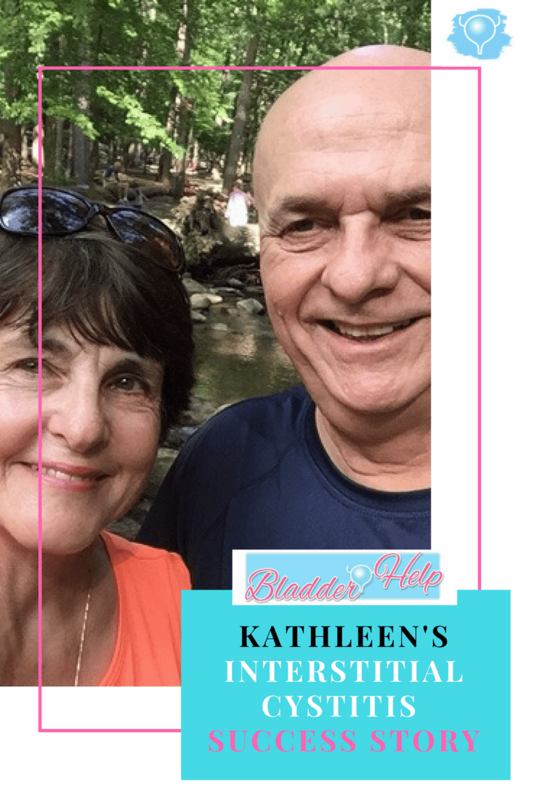 Together with her husband Roy, Kathleen finally found the root cause of her interstitial cystitis and this empowered her to overcome this condition. This story is an account of Kathleen’s journey with interstitial cystitis, written by her husband Roy. I hope this story will be an inspiration for you to keep searching for answers… Healing is possible! suffered and are currently suffering from the “Chronic Condition” known as Interstitial Cystitis. grain products that are contained today in everything we eat. modifications and offer some flexibility of longer distance travel. occurring Intense pain became much more of a lifestyle changer. Visits first to our General Practitioner and then to a series of Specialists led us to a path of searching for what exactly was causing the intense pain and, for starters, where exactly in her body was it occurring! While the pain was isolated in the abdominal area, it was not at all obvious whether it was involving the Stomach/Intestinal tract, the Urinary Tract, the reproductive organs, or something else. Words like “Pelvic Sling” , IBS (Irritable Bowel Syndrome), Bladder Infection, Kidney infection, Bladder Cancer, Bladder Distention, etc. entered and lived in our vocabulary as we searched for a Definition, a Cause, and a Cure. Recognizing the extreme nature of her case, our Specialist had even given us literature to consider a kind of implant that would actually reduce the intensity of the pain by stimulating more frequent minor episodes. (A Pace-maker for Bladder Pain? Really?). We declined to seriously consider such a device and continued on this path for over a year when we learned that our Insurance Plan was no longer covering any part of this drug Elmiron. This prompted us to look for a new Insurer and forced us to find a new “In-Plan” Specialist. Bladder with Botox Injections every three months. Sounded quite Desperate to us! she had found relevant on the topic. one doing the periodic RoundUp spraying during the immediately preceding 12 month period. Lavender to the bath water made this the lowest cost and most pleasurable way to get over IC! The absence of her horrible bouts with the intense pain of Interstitial Cystitis could actually have passed? suffering any longer. We even found ourselves driving a hundred miles without a bathroom break! It was at this point that I first wrote a letter to the Interstitial Cystitis organizations with copies to Dr.
Seneff, acknowledging what I believe is the way to overcome this Chronic condition. the Glyphosate and GMO’s from entering our bodies in the first place! help by viewing and listening to the ideas and recommendations of this wonderful Professor. Thank you so much, Layla. We hope that this story helps you and your readers overcome Interstitial Cystitis. I have also asked Dr. Stephanie Seneff to write a Technical paper on her findings of particular relevance to IC. We will advise you whenever we have additional information available at our side and hope to hear from you that some of your readers are able to be encouraged and helped by our story. Note: The “prescribed 3 does per day. ” in paragraph 8 should be: prescribed 3 doses per day. Thank you so much for your story. My daughter 27 has just been diagnosed with IC which she has been trying through many many doctors to treat and diagnose for the past year. She is now in the process of going back to basics as far as foods she can and can’t eat but would love any input into suggestions etc that may help her. As a mother it is heartbreaking to see her going through it but I must say to have a diagnosis finally and something “concrete “ to work with is positive for her. Hi Bernadette, so sorry your daughter has to go through this. I have diet suggestions in the ‘protocols’ section of the blog. Going back to basics is a good idea, especially removing inflammatory, processed and allergenic foods – i.e. processed vegetable oils, white flour products, sugar etc and replacing them with nutrient dense foods – vegetables, grass-fed or free-range meats, fruits, fish, fermented foods etc. I did a lot better when I removed grains entirely. Working on the gut flora is important too. Bear in mind that a negative urine culture doesn’t mean there’s no infection – these tests are outdated and miss many infections. Sorry to hear that your daughter is experiencing IC, but I also remember our actual sense of relief when we finally received a diagnosis of the problem. I hope that you will view the Video I mentioned in our story as I believe you will find Dr. Stephanie Seneff to be a real resource to help overcome this condition. I still have the contact information as well as some of the reference files that Seneff sent to me if you feel that this would be as helpful as I do.